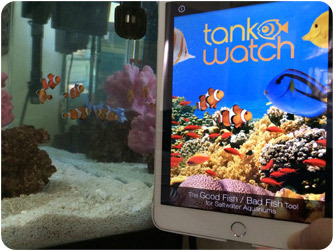 TANK WATCH is a free mobile app that provides aquarium owners with information for eco-friendly tropical fishkeeping. Tank Watch makes it easy to search for the “GOOD” fish—those bred in captivity and not caught from the wild on coral reefs. 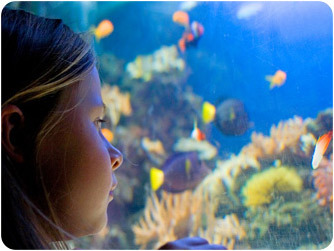 Nearly all fish living in saltwater aquarium tanks began their lives thousands of miles away on warm tropical reefs. These fragile fish and wildlife taken from the reef often die before reaching personal aquariums. 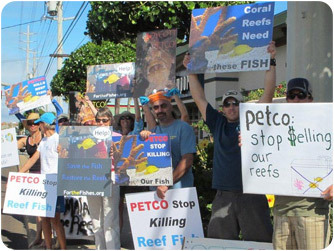 Most fish taken from the reef die from poisoning, the stress of captivity or inhumane practices used in handling and transport to the pet store. 80% of the fish deaths in personal aquariums are due to poor practices in the supply chain. Tropical fish are stewards of the reef. They help keep coral reef ecosystems healthy and in balance. By removing these fish, coral reefs become more susceptible to stress from warming oceans, bleaching, and ocean acidification. Keeping fish on the reef is essential for healthy and resilient coral reef ecosystems. Over 50% of wild-caught aquarium fish purchased from U.S. companies tested positive to exposure to cyanide. Cyanide fishing destroys coral reefs and their wildlife, and over 90% of cyanide-caught fish will die within weeks. Wildlife captured throughout Hawaii since 1976 (fish + invertebrates). Source: collection reports submitted to the state by aquarium fish catchers. For the Fishes (FTF) is a nonprofit, tax-exempt charitable organization dedicated to protectiing coral reef wildlife.